The world we live in today is filled with stories. The rich history of things and events make us appreciate the places we live in. The more we know about the history, the more we appreciate how the country or region has developed, progressed and transformed. We need the history as our guide. We can use the past as a light to what we can do to better the things in the present. In this article, we will try to learn the rich history of Puget Sound to appreciate how it has transformed today. Let’s start. The History It may be necessary to start the history of Puget Sound in 1792. It was the great explorer George Vancouver who first discovered Puget Sound and claimed it for the expansion of the empire of Great Britain. He claimed the land on June 4, 1792, and since then helped develop the progress of the region. One of the companions of Vancouver was Lieutenant Peter Puget, which led to the name. https://www.carvedlakeart.com/category-s/169.htm Check out carvedlakeart if you want the best deals on lake art in Puget Sound, laser cut map, and charts of the lakes, streams and oceans of the world. Another historical landmark of Puget Sound was in 1818 when the United States and Great Britain both claimed the Oregon Country. Because of such claims, they agree to what is called a joint occupancy. This agreement led to the resolution of the Oregon Boundary dispute. In 1846, the Oregon Treaty was signed, and Puget Sound was then made part of the regions that were disputed by both parties in 1846. Another interesting historical event in Puget Sound happened during the early European settlement. This happened in Fort Nisqually, which is a fur trade post in HBC aka Hudson’s Bay Company. It was during this time that the Puget Sound Agricultural Company established their businesses. The farms and ranches established helped export food and provisions from and to Fort Nisqually. Further, the first American Settlement that happened on Puget sound was the people of Tumwater. This group was founded last 1845 by the group of Americans that came via the Oregon Trail. There were also settlements north of the Columbia River. This group of settlements was led by George Washington Bush to create restrictions among the citizens. It would also be useful to know that in 1853 the Washington Territory in Puget Sound was formed, partly because of the Oregon Territory. The Northern Pacific railroad project in Puget Sound was also one significant part of its history in 1888. When this link was created, many businesses in the area boomed with great improvement. 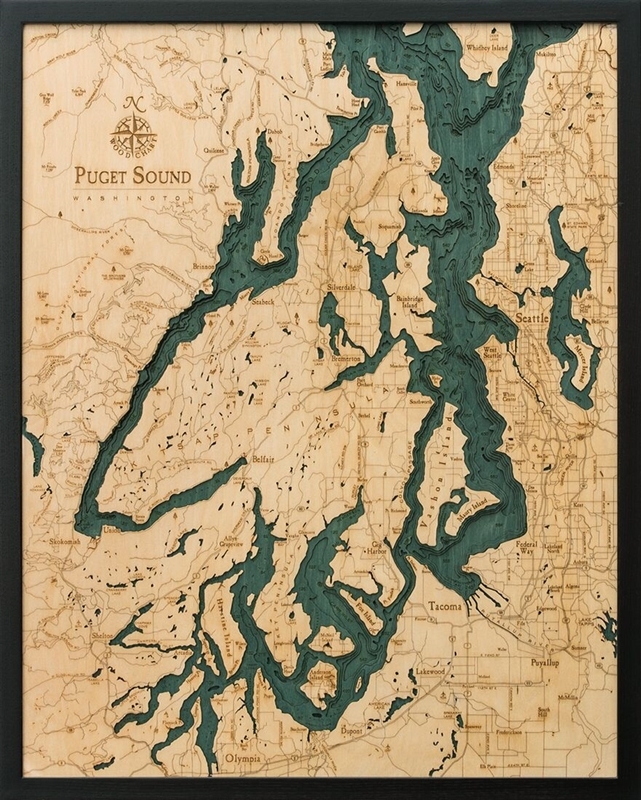 https://www.carvedlakeart.com/category-s/169.htm Check out carvedlakeart if you want the best deals on lake art, wood map in Puget Sound, laser cut map, and charts of the lakes, streams and oceans of the world. The history of Puget Sound is filled with stories. These stories form the foundation of the people, explorations, and tragedies that had happened to grow the land. It is also because of these events that make Puget Sound a rich region to explore. In this article, you also learned that Puget Sound forms the rich landscape of the American History. Without it, the story of the growth of America would not be complete. Without the stories these events formed, we wouldn’t have an entirely different story of how the world has historically grown.